Houzz 61 of our visitors have told a friend about this plan. 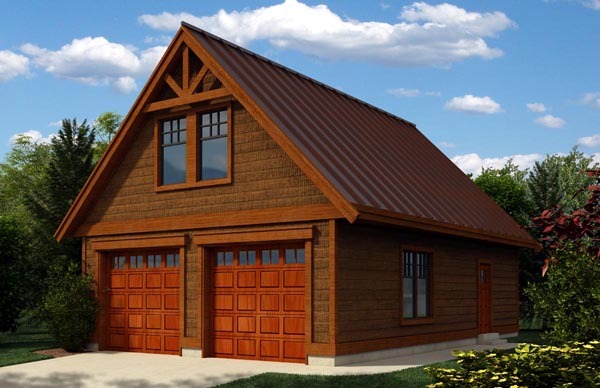 Rustic shingle wall exterior capped with sleek metal roofing ensures that this detached garage with workshop will blend into and compliment any building site location. The workshop portion of this open floor plan boasts the added convenience of a full bath. Add a partition wall to separate the garage from the workshop for additional comfort or increased security. The unfinished second level with vaulted ceilings is intentionally left undeveloped to allow your personalization of this space. Question: Building codes in our area require a snow load of 84 psf. The current design is 32. What are the structural member sizes and spacing? Can this design be modified? Question: Is there a wall between the garage and workshop area? Answer: The garage has a nine foot ceiling height with two nine foot wide by eight foot high garage doors. I would be happy to modify this garage to suit your specific requirements, if required. Question: Can you put in the electrical fixtures and plumbing fixtures for a kitchen down stairs where the work shop bench is. Also how much head room is in the loft area and what the width of the area is from 6ft to 6ft. Answer: Yes to converting the garage workshop into a kitchen area. The inside dimensions for this space is 10’-4” wide by 11’-6” deep. If this garage loft is intended to sleep in, and the garage is to have vehicles, you would need to close off between the garage and the living space. Presently the loft is open to the garage. The loft slopes from 2” at the exterior wall to 10’ at the interior peak. The middle portion measured at 6’-6” high would have a width of 10’-4”. Please email with questions or if you require any additional information. Question: what is the overall height of this plan? Answer: The overall height for design is 24’-2”, from the finished grade to the ridge.